The Smart Fortwo electric drive, or smart ed, is a battery electric vehicle variant of the Smart Fortwo city car, formerly marketed as the Smart Fortwo EV. Field testing began in London with 100 units in 2007. The second generation was introduced in 2009 and was available in 18 markets around the world for leasing or through the Car2Go carsharing service in selected cities, with over 2,300 units delivered. A near production version was unveiled at the September 2011 Frankfurt Motor Show. Deliveries of the third-generation Smart began in the U.S. and Europe from May 2013, and Smart plans to mass-produce the electric car with availability in 30 markets worldwide. More than 8,800 units of the second and third generation Smart ED have been sold in North America and Europe between 2009 and June 2014, of which, over 6,500 units are third generation variants. A Smart ED Police Car in central London. The first Smart electric drive vehicles were modified by Zytek Electric Vehicles. It is powered by a rear-mounted motor driving the rear wheels. It runs on 13.2 kilowatt hours of sodium-nickel chloride Zebra batteries. Field testing began in London with 100 vehicles in 2007 and was available only for lease to corporate clients for £375 per month. The second generation, Smart ED2, was introduced in 2009 to 18 markets with the objective to gather experience about how customers use and charge electric vehicles. Daimler initially planned to build 1,000 vehicles, but as demand exceeded the company’s expectations, more than 2,000 Smart Fortwo electric drive cars were produced. The electric cars were available for leasing or through the Car2Go carsharing service in San Diego, Amsterdam and Vancouver. 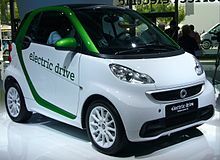 Production of the second-generation Smart Fortwo electric drive began in November 2009 in Smartville, Hambach, France. The Smart ED2s have a 14 kilowatt-hours (50 MJ) lithium-ion battery and a powertrain provided by Tesla Motors. The range of a fully charged battery is up to 135 kilometres (84 miles) under the New European Driving Cycle (NEDC) cycle. Smart Fortwo "electric drive" badge. As part of a three-phase roll-out program, phase two began with field testing in Berlin in December 2009 with 100 units out of 300 that will be deployed in Germany. For phase two 1,500 cars were produced, and field tested in Hamburg, Paris, Rome, Milan, Pisa, London, the English Midlands, Madrid, Zurich, Portugal, Denmark, the Czech Republic, Austria, Belgium and the Netherlands during the first half of 2010. In October 2010, 250 units were made available for field testing in several cities in the United States. Testing also was conducted in Canada; and in 2011 in selected markets in Asia. Phase three of the program is mass production, which was scheduled to begin with the 2012 model year. In the United States sales were scheduled to begin in 2012 with the 2013 model year. On July 2011 an agreement was reached between Daimler AG and Robert Bosch GmbH to develop and produce innovative traction motors for electric vehicles. Based on this joint venture, Daimler planned to use the improved traction motors with the third generation of Smart electric drive cars scheduled to go on sale in 2012. The lithium-ion battery pack takes three hours to charge from 20 to 80 percent of its capacity with a standard 220 V outlet. It can also be charged using a common US household 110 V outlet. The car has a 3.3 kW on-board charger for this "level 1 and 2" charging. Smart claims a 0-to-60 kilometres per hour (37 mph) time of 6.5 seconds, the same as for the gasoline version. It has a single fixed-gear ratio transmission and is about 308 lb (140 kg) heavier than a gasoline-powered Fortwo. Over 2,300 units of the second generation models were leased between 2009 and October 2012 in 18 markets around the world. Of these, 1,721 units were registered in Europe through October 2012, and 527 units in the U.S. through December 2012. The trial program in the US began in January 2011 with the first customer delivery in Washington, DC. A total of 250 units were made available for leasing at a price of US$599 per month for a period of 48 months and 60,000 kilometres (37,282 mi), plus US$2,500 due at signing. This pricing is before taxes or any government tax credits or rebates available. The limited fleet of second-generation Smart Fortwo electric drive cars was introduced first in Portland, Oregon, Los Angeles, San Jose, California, Orlando, Florida, Austin, Detroit, Indianapolis and the Interstate 95 corridor between Washington, D.C. and Boston, including New Jersey and New York. In July 2011, Car2Go announced the deployment of a fleet of Smart EDs into carsharing service in San Diego before the end of 2011. The company stated that the carsharing electric cars will have a range of 84 miles (135 km), and, based on their experience with usage in other cities, they will most likely need to be recharged every two or three days. When reserving the electric car online, San Diego Car2Go members are able to see the battery's state of charge, so if the customer wants to go for an extended drive, the option is available to find the right car for that trip. Monroney label showing United States Environmental Protection Agency's fuel economy and environmental comparison label for the 2011 Smart ED. In November 2011 fleets of 300 Smart EDs each were deployed in San Diego and Amsterdam as part of the Car2Go service. As of December 2012[update], a total of 527 Smart EDs were registered in the US since January 2011, including 300 units deployed for Car2Go in San Diego. Considering an energy consumption of 39 kilowatt-hours per 100 miles (22 MJ/km) and a conversion factor of 33.7 kW·h of electricity being the energy equivalent of a US gallon of gasoline (32 megajoules to the litre), the US Environmental Protection Agency officially rated the Smart ED combined fuel economy at 87 miles per gallon gasoline equivalent (mpg-e) (2.7 L gasoline equivalent/100 km; 104 mpg-imp gasoline equivalent), 94 mpg‑US (2.5 L/100 km; 113 mpg‑imp) city and 79 mpg‑US (3.0 L/100 km; 95 mpg‑imp) highway. EPA's official all-electric range is 63 miles (101 km), but in favorable conditions in an urban environment at warm temperatures the carmaker claims the Smart Fortwo ED can reach up to 98 miles (158 km). According to Forbes, the American Council for an Energy Efficient Economy ranked the Smart ForTwo Electric Drive the "greenest" car for 2014. A total of 152 Smart EDs were registered in France since 2010 through December 2012. The third-generation Smart electric drive, Smart ED3, was unveiled at the September 2011 Frankfurt Motor Show. Key differences with the second-generation model include a more powerful electric motor, which improves acceleration and top speed; a new lithium-ion battery pack that will allow to increase the range to 140 kilometres (87 mi) and an option for quick-charge will be available; and other features include an enlarged grille opening, stylish LED daytime running lights, wider door sills, some minor modifications to the rear, fully automatic air conditioning with pollen filter and pre-air conditioning. Several features will be controlled remotely through a smart drive application for the iPhone. In Germany the Smart ED will be available for €16,000 (around US$22,400) plus a monthly fee of €60 (US$84) for the battery rental. Online reservations are scheduled to begin in the fourth quarter 2011. In the US pricing will start at Price US$25,750 and Price US$28,750 for the Soft Top Cabriolet before any applicable government incentives. Canadian pricing for the Electric Drive starts at CA$26,990 and the cabriolet version starts at CA$29,990. The third-generation Smart electric drive was released in the US in May 2013 with 60 units delivered that month. Sales in Europe also began in May 2013. Smart plans to mass-produce the electric car with availability in 30 markets worldwide. In February 2014, Smart announced it would be offering the 2014 model year nationwide, not just in the CARB states as the 2013 model year was. Global sales of the third generation model reached 4,130 units during 2013. The Smart ED 3 was the top selling plug-in electric car in Germany in 2013, with 2,146 units registered through December 2013, representing 32% of the 6,711 Smarts sold in the country. After the German market, European sales were led by France, with 478 units registered through December 2013. U.S. sales totaled 923 units through December 2013. Global cumulative sales of the third generation variant reached 6,514 units up to June 2014, while combined sales of second and third generation reached 8,814 units as of June 2014[update]. As of June 2014[update], combined sales of both generations reached 3,959 units in Germany, 2,542 units in the U.S. and 865 units in France. The Smart ForJeremy is a version of Smart ForTwo electric drive designed by Jeremy Scott. It included bright white body colour, chrome-plated tridion cell, a wing made of transparent fibreglass and decorated with rocket-shaped elements that light up red, wider rear tyres and wider rear wheel arches, wheel rims are shaped like aeroplane propellers, bright chromium-plated "eyebrows" above its front headlights, chromium-plated top half of the mirror caps and the frame around the radiator grille, fine white nappa leather upholstery at instrument panel, seats and door trim; diamond stitching at seat insert areas and the centre panels in the doors, bright chromium-plated side air inlets. The vehicle was unveiled on the eve of the LA Auto Show at Jim Henson Studios in Los Angeles, with music provided by the artist M.I.A. Production version was planned in 2013 in limited quantities. Smart ForTwo ED at Geneva Motor Show 2017. The fourth generation model, C453, was made available for sale in the USA on 9 August 2017, as a 2017 model. The gasoline models will no longer be sold in Canada and the USA. With the new body and the Renault/Mercedes Edison Platform, it is available with electric drive and a 17.6 kWh battery. It has an EPA Certified range of 58 miles. The charge rate is 7.2 kW. Also available as a cabriolet, it is the only current production electric convertible in the world. Smart Electric Drive in the Geneva Motor Show, 2009. Brabus-tuned Smart Fortwo ED concept at the Geneva Motor Show. ^ a b c d e f g "smart fortwo electric drive Debuts in the US". Green Car Congress. 9 June 2010. Retrieved 9 June 2010. ^ a b c d Michael Austin (June 2010). "2011 Smart Fortwo Electric Drive – First Drive Review". Car and Driver. Archived from the original on 12 June 2010. Retrieved 10 June 2010. ^ a b c d e Jeffrey N. Ross (3 October 2012). "Smart ForTwo Electric Drive will be cheapest EV at $25,000*". Autoblog.com. Retrieved 10 October 2012. ^ a b c "Third-generation smart fortwo electric drive to launch worldwide in spring 2012; first use of battery packs from Daimler JV Deutsche Accumotive and motor from JV EM-motive". Green Car Congress. 16 August 2011. Retrieved 10 October 2012. ^ a b c d Eric Loveday (16 August 2011). "2012 Smart Fortwo Electric Drive hits 75 mph, whizzes to 60 in 13 seconds". AutoblogGreen. Retrieved 17 August 2011. ^ a b Jay Cole (5 May 2013). "Another EV Hits US Shores, As Smart Sells 60 ForTwo Electric Drive Mini-Cars In May". InsideEVs.com. Retrieved 6 June 2013. ^ a b c Karla Sanchez (4 October 2012). "Smarter Car: 2013 Smart Fortwo Electric Drive Starts at $25,750 – Photos Galore". Motor Trend. Retrieved 10 October 2012. ^ a b c d e Jose Pontes (30 January 2014). "World Top 20 December 2013 (Special Edition)". EV Sales. Retrieved 6 February 2014. ^ a b c d Jose Pontes (30 July 2014). "World Top 20 June 2014 (Special Edition)". EV Sales. Retrieved 2 August 2014. A total of 2,384 Smart EDs were sold worldwide in the first half of 2014. ^ Andrew Anthony (21 March 2009). "Smart Fortwo Ed: Is the future a Smart one?". The Guardian. Retrieved 10 June 2010. ^ a b "car2go launches North America's first all-electric carsharing network in San Diego". Green Car Congress. 18 November 2011. Retrieved 18 November 2011. ^ a b "Daimler's car2go launches large-scale all-electric vehicle car-sharing fleet in Amsterdam". Green Car Congress. 27 October 2011. Retrieved 18 November 2011. ^ Nikki Gordon-Bloomfield (16 September 2015). "Report: Next-Generation Smart ForTwo Electric Drive Will Feature Renault-Made Motors". Transport Evolved. Retrieved 29 August 2017. ^ a b c d e f g h i Sebastian Blanco (10 June 2010). "250 Smart EDs coming to US this fall with $599/month leases attached". Autoblog Green. Retrieved 10 June 2010. ^ "smart goes into series production with second-generation electric drive". Daimler AG. 20 August 2009. Retrieved 22 August 2009. ^ ""e-mobility Berlin" delivers smart solutions for electric mobility". Daimler AG. 17 December 2009. Retrieved 10 June 2010. ^ a b Jim Motavalli (11 June 2010). "The Electric Smart: A Car That Seems to Demand Batteries". New York Times. Retrieved 15 June 2010. ^ "Daimler and Bosch form electric traction motors joint venture; motor to debut in new smart fortwo electric drive in 2012". Green Car Congress. 14 July 2011. Retrieved 15 July 2011. ^ Justin Aschard (30 November 2012). "Inmatriculations VP et VUL Europe 18 à fin Oct. 2012 (2010-2012)" [Registrations of passenger cars and utility vehicles in Europe 18 through October 2012 (2010-2012)] (PDF) (in French). France Mobilité Électrique. Retrieved 10 February 2013. ^ a b c "December 2011 Dashboard: Sales Still Climbing". HybridCARS.com. 9 January 2012. Archived from the original on 12 January 2012. Retrieved 11 January 2012. A total of 388 units were registered in 2011. ^ Nick Chambers (27 January 2011). "Smart USA Delivers First ForTwo Electric Car—Also Available as a Convertible". PluginCars.com. Retrieved 27 January 2011. ^ Sebastian Blanco (14 July 2011). "In depth: Car2go goes electric in San Diego". AutoblogGreen. Retrieved 14 July 2011. ^ a b U. S. Environmental Protection Agency and U.S. Department of Energy. "2011 smart fortwo electric drive cabriolet". Fueleconomy.gov. Retrieved 19 April 2011. 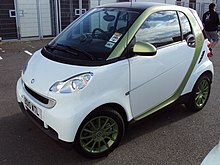 Select Model Year 2011 and Electric Vehicles, then click on any of the two trims for smart for two electric drive. ^ "Electric drive: Technologty". Smart USA. Retrieved 30 January 2011. ^ Gorzelany, Jim. "The 'Greenest' Cars For 2014 – Forbes". Forbes. Retrieved 30 January 2014. ^ Autoactu.com. "Chiffres de vente & immatriculations de voitures électriques en France" [Sales figures & electric car registrations in France] (in French). Automobile Propre. Retrieved 10 February 2013. See "Répartition des ventes de voitures électriques par modèle sur 2012/2011"
^ a b "Third-generation smart fortwo electric drive to launch worldwide in spring 2012; first use of battery packs from Daimler JV Deutsche Accumotive and motor from JV EM-motive". Green Car Congress. 16 August 2011. Retrieved 17 August 2011. ^ "Smart Fortwo Electric Drive Priced at €16,000 in Germany". Electric Cars Report. 15 September 2011. Retrieved 15 September 2011. ^ Szostech, Michael. "2013 Smart Electric Drive is lowest priced electric car in the US". Retrieved 31 October 2012. ^ Mike Szostech. "Smart Electric Drive pricing announced for Canada". My Electric Car Forums. Retrieved 22 March 2013. ^ Michael Szostech. "Smart ForTwo Electric Drive now available nationwide". My Electric Car Forums. Retrieved 6 February 2014. ^ Trefis Team (3 June 2014). "How Daimler Could Capitalize On China's Push For EV/HEVs". Forbes. Retrieved 2 August 2014. ^ a b Autoactu.com. "Chiffres de vente & immatriculations de voitures électriques en France" [Sales figures & electric car registrations in France] (in French). Automobile Propre. Retrieved 2 August 2014. See "Ventes de voitures électriques en 2010/2011/2012/2013/2014." ^ a b Cole, Jay (6 January 2014). "December 2013 Plug-In Electric Vehicle Sales Report Card". InsideEvs.com. Retrieved 6 February 2014. ^ Justin Aschard (30 November 2012). "Inmatriculations VP et VUL Allemagne à fin Oct. (2010-2012) 2012" [Registrations of passenger cars and utility vehicles in Germany through October 2012 (2010-2012)] (PDF) (in French). France Mobilité Électrique. Retrieved 2 August 2014. A total of 106 Smart EVs were registered in Germany in 2010. ^ Autobild (12 January 2012). "2011 Full Year Best-Selling Electric Cars in Germany in 2011". BestSellingCars.com. Retrieved 8 July 2014. A total of 328 Smart EVs were registered in Germany in 2011. ^ BestSellingCars.com (3 May 2013). "2012 (Full Year) Germany: Best-Selling Electric Car Models". BestSellingCars.com. Retrieved 2 August 2014. A total of 734 Smart EDs were registered in Germany in 2011. ^ Jose Pontes (14 July 2014). "Germany June 2014". EV Sales. Retrieved 2 August 2014. A total of 645 Smart EDs were sold in Germany in the first half of 2014. ^ Jeff Cobb (2 July 2014). "June 2014 Dashboard". HybridCars.com and Baum & Associates. Retrieved 2 July 2014. A total of 1,092 Smart EDs were sold in the U.S. during the first half of 2014. See section: "U.S. Battery Electric sales for June 2014"
^ Thomas Frankenstein (22 June 2012). "Fahrspaß für die City der Elektro-smart in seinem Element". E-Mags Media GmbH. Retrieved 5 September 2017. ^ Mike Szostech. "Smart Electric Drive receives EPA ratings". MyElectricCarForums.com. Retrieved 21 December 2012. ^ Dorothee Tschampa (30 December 2013). "Daimler Electrics Get Fake Vroom to Thwart Silent Threat: Cars". Bloomberg. Retrieved 1 January 2014. ^ Steven Loveday (8 June 2016). "Turns Out Tesla Actually Made An Electric Smart Fortwo That Could Do Wheelies". InsideEVs.com. Retrieved 19 August 2017. 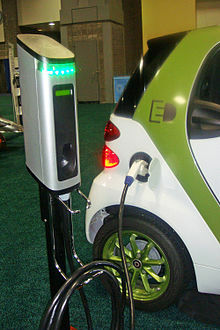 Wikimedia Commons has media related to Smart electric drive. This page was last edited on 21 September 2018, at 11:59 (UTC).